On Sunday afternoon I wandered away from my tour group and sat by myself at a picnic table in front of the San Diego Museum of Art, and ate a wrap I’d bought from a cart and finished reading A Pale View of Hills. Most likely if I had asked some of the other people with me if I could join them, or if they’d like to join me, they’d have said yes, and I felt that perhaps I ought to have done that, but it was nice to have the time to myself. Every year I look forward to the Medium Festival of Photography, four glorious days of art and discussion and camaraderie, my favorite event in this or really any town. Beforehand, I count down the days, and afterwards I am filled with longing for the kind of connection I’ve just had, the experience of finally being among my people. It’s wonderful and it’s exhausting. I’m at my best, I think, when I’m able to celebrate my peers. This friend has a solo museum exhibition, that friend has an amazing new book, this one just had a great interaction with a reviewer, that one sold both of his prints within half an hour of the show opening, and I’m thrilled. My friends’ successes make me feel like a part of something bigger than myself, like things are actually right with the world, and I wonder why I can’t feel that way about my own successes, why I feel embarrassed when someone asks to see my work, why I feel the need to apologize when, afterwards, they thank me and pay me a compliment. Why do I feel the need to make myself small? Why is it hard for me to admit that I’m proud of my own work? It’s the strangest thing in the world to exult and shrink in the same moment. Of course it’s not about the work, it’s always just me. In truth, I’m past feeling insecure about my photographs. I know what I’m trying to do with my images and my books, and why, and I believe that I have done what I set out to do, and done it well. Honestly, I think I’m good at what I do, and I don’t much care if people don’t like the work. It’s not the rejection that hurts, it’s the acceptance. If it sounds like the weekend has been difficult for me and not like it was a joyful, inspiring, glorious experience, it’s because I’m doing a poor job of describing it, obsessing about details instead of filling in the whole scene. I got to spend four days swimming in art, filling my lungs with it, dancing with it until I collapsed in exhaustion only to begin again the next morning. I made new friends and reconnected with old ones, I had some amazing conversations, and received so much kindness from people who don’t owe me anything. If I am unable to simply bask in such warmth, it is a shortcoming of mine, not of the place or people with whom I spent the time. If my twenties were a process of coming to terms with and accepting a comforting sense of mediocrity, then perhaps my thirties have been the process of letting that go. My forties aren’t too far off. It’ll be interesting to see how they go. I realized the other day that most of my favorite TinyLetters are written by people much younger than me. There’s a feeling of incipience and urgency that I enjoy reading but struggle to find in my own narrative lately. There’s a way in which middle age—and if I’m being honest with myself, that’s where I should rightly place myself these days—seems to resemble the heat death of the universe. 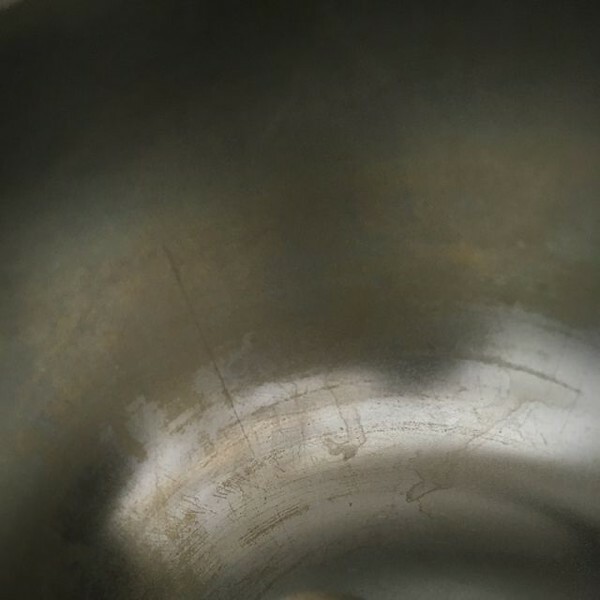 That is to say, one hypothetical fate of the universe is to reach an eternal steady state in which entropy is maximized and nothing happens anymore, and each moment is indistinguishable from the one just before or just after. This is how life feels sometimes once you’ve moved past your youth. Being young has a built-in sense of direction, of growth, of motion. You feel you are building toward something, even if you don’t know what that something is—at least, that is how I felt. But eventually you settle into a routine, and your life becomes what it is. From day to day, week to week, year to year, nothing much happens to distinguish the current moment from any other. This isn’t true, of course. It just feels true, probably due to a short attention span. Mind you, this has always been true, but lately, reminders of this untruth have tended to smack me in the face. My 20th high school reunion was a few weeks ago, and I had a surprisingly good time. For most of my life I’ve had a lot of social anxiety and the prospect of having to make small talk always makes me squirm, but the combination of having hosted an interview podcast for nearly two years, and the realization that I was legitimately interested in hearing people’s stories made the night quite enjoyable. Now, I had expected to hear a lot about what my classmates had been up to for the past two decades—and that did, indeed, happen—but what I wasn’t prepared for was hearing so many recollections about myself. Especially ones I had forgotten. I wrote about this a couple of years ago for my blog, how people can have such different memories of an event, and how the meaning of those memories shape our lives. It’s jarring, to say the least, to realize that the story you tell about yourself is incomplete. I tend to see my adolescent self as fundamentally self-absorbed, usually well-meaning but sometimes petty or cruel—which is to say: a teenager—and generally unremarkable. That so many people not only remembered me, but remembered specific kindnesses I’d shown them or specific times I’d helped them or done right by them, it shook me. Not just because the edges around the holes in my memory have the same texture as the edges of my existence, but because it forces me to reevaluate the things I want to believe about myself now. One of the most freeing realizations I’ve had in my life was how comfortable mediocrity is. This epiphany came after failing the first exam I took in college, which was shocking but also felt a bit like flying—to this day, I’m not sure I’ve ever laughed harder or longer than the day I got my score back on that test. Excellence has its comforts, too, but it comes with responsibility. Mediocrity places no demands. And if unimportance takes the shine off of my achievements, it also takes the sting out of the harm I’ve caused. You have to matter to someone in order to hurt them. After the party I drove a friend back to his hotel room, and on the way he told me stories about how good a friend I’d been to him, back in the day. I wanted to argue with him, to tell him that I was nothing special, then or now. I wanted to insist, and by insisting, to take away something from his story, something which he treasures. What would I take from anyone to keep myself comfortable, to avoid the responsibility of living up to being something? I kept my insistence to myself, and sat and listened to his stories, and gave him a hug before we parted. This isn’t ending where it began, which I suppose is appropriate. I’m learning. At least, I’m trying. At about 4:30 this morning, my son wandered into my bedroom and told me that he'd had a bad dream. He said that he had been running away from Voldemort, that Voldemort had been killing everybody around him and he had to get away, and then he woke up. I let him lie down between me and my wife, and within a few seconds he was asleep again. An hour and a half later, my alarm went off. I rolled over and picked up my phone from where it lay on my nightstand, to be greeted by a whole night's worth of push notifications from different news services. Each new message told a story worse than the last—first a warning about an active shooter, then two dead, then twenty, then fifty. I put the phone down, turned and reached down to where my son lay, still warm and unaware. I put my hand on his back and he stirred. "Time to get up, buddy," I said. He stretched and sat up. I didn't tell him what I'd just read, nor his sisters. I don't think I will. That they don't have to be burdened with such horror is a privilege, of course. I don't believe in magic. It has nevertheless been years since the last time a nightmare sent my son seeking comfort and reassurance from me or his mother in the middle of the night. That the image which so terrified him was of crowds of people running while a dark figure indiscriminately snuffed out lives all around him is... Well, it's the kind of thing that makes me wonder about coincidences. The thing that hurts the most about a day like today, like any of these days with which we have all become so unfortunately familiar, is the certain knowledge that the world is like this because that's how people want it to be. Oh, sure, they may profess shock or grief on a day like this one, but still nothing happens, nothing changes. Not when a man stormed into an elementary school and killed twenty children. Not when an avowed racist looking to start a race war entered a church and killed nine people. Not when a police officer shot and killed an unarmed 12-year-old on camera. Is it just guns? No, of course not. White supremacists march openly through the town square and the President makes excuses while well-meaning onlookers wrap themselves in the First Amendment and "tut tut" about campus protests. Houston, Florida, and now Puerto Rico—not to mention all of those other Caribbean islands—are demolished by successive hurricanes, but of course millions of Americans still believe that climate change is a hoax, including the head of the EPA. Closer to my home, a local Congressman is calling for war with North Korea. And city officials twiddled their thumbs for months while a hepatitis outbreak ballooned and claimed lives, only bothering to take action when the deaths made national news. (Meanwhile, of course, the amount of affordable, or even available, housing continues to fall in the area, jagged rocks are still under most of our overpasses, and now the city is clearing the streets without giving the homeless anywhere to go.) Nothing changes. Let's not pretend that this isn't who we are. This is it. We have the money and the means to make life better, to protect those who need protecting, to save the planet. We know what we need to do, if not to solve our problems then at least to improve them. But we don't, because in our hearts we don't want to. Because whether it's guns or oil or property values or white supremacy, no price is too high to keep things comfortable for those who aren't already suffering. Because having to admit that solutions are available would mean admitting that we're part of the problem. The greatest source of harm in this world isn't greed, it's the inability to tolerate any amount of emotional discomfort. After my kids left for school this morning, feeling heavy and sliding toward despair at the morning's news, I headed into the bathroom to get cleaned up for work. 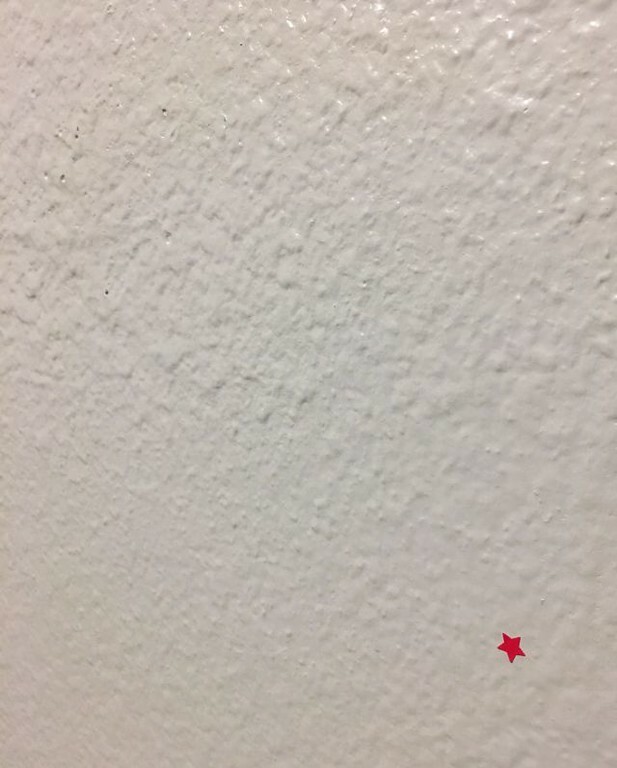 I noticed a small shape on the wall, about waist level to my three-year-old, a tiny red star no larger than two grains of rice stuck together. And for a brief moment, things didn't seem so bad. There is, as always, yet innocence and beauty and simple joy in the world. No joy is ever quite so pure as that of a toddler with a sticker, and how seductive that feeling is when all is wrong with the world. How I'd love to stay there in that space. Who wouldn't? But that would be giving up, just as surely as would despairing. I don't have any answers. I never have. I don't know how to make people care. At least, not enough to make them take an honest look in the mirror and change. Do I even care enough? I don't know. I just know that I'm sad and angry and tired as hell. I close so many letters or lists or threads by saying "I wish you peace." And I do. And I want to say that now. But the truth is that there will be no peace unless we make it, and we can't do that without struggle, without discomfort. I keep thinking that people will get there eventually. I hope we do. Me, too.